In a week that's seen Lego Movie 3D storm the box office charts, no doubt thanks mostly to its audience of young boys. Disney brings us something for little princesses. "Tinker Bell and The Pirate Fairy" is the fifth film in a series that has taken over 200 million dollars in DVD sales alone. 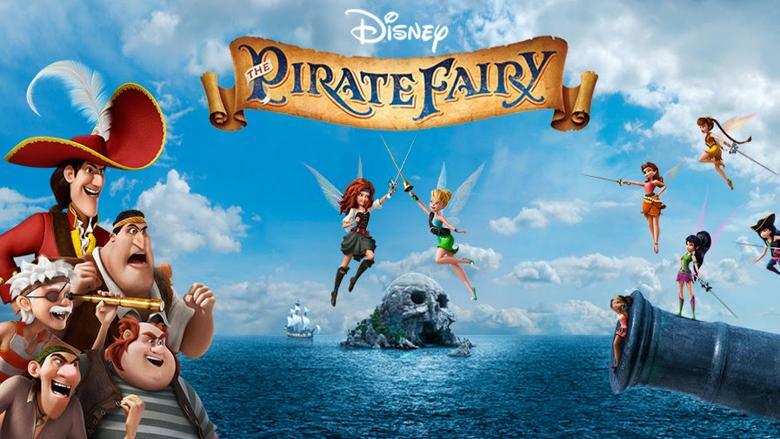 "Pirate Fairy" is a prequel of sorts to "Peter Pan" and follows Tinker Bell as she tries to recover Blue Pixie Dust that has been stolen from Pixie Hollow by a dust-keeper fairy called Zarina (Christina Hendricks). Tinker Bell is joined on her quest by five other fairies, each with their own different powers. Along the way they find that Zarina has teamed up with the scheming pirates of Skull Rock, led by a cabin boy called James (Tom Hiddleston), who will later come to be known as Captain Hook. The pirates want the Blue Pixy Dust for their own use and Tinker Bell and her friends must race against time to retrieve the Dust and return home in time to save Pixie Hollow. "Pirate Fairy" as you can imagine is aimed fairly and squarely at young girls. Any that are enchanted by any of the Disney Princess stories will find much to keep them amused here. Most of the comedy moments come as a result of Tinker Bell and her friends having their talents switched by Zarina. Tinker Bell becomes a water fairy, Vidia becomes an animal fairy, and so it goes on. It wouldn't be a Disney film without some catchy songs being peppered throughout its running time and you'll be pleased to know that "Pirate Fairy" doesn't disappoint. Natasha Bedingfield sings the pop theme song "Who I Am"' and there's a rather dubious pirate song about flying frigates. Adults that are forced along under duress can have some fun spotting the connections to other Disney films. There are Pirates here so one of the films isn't that hard to workout. If your children enjoyed any of the previous Tinker Bell films then this won't disappoint. They can even look forward to number six, Tinker Bell: Legend Of The Neverbeast which is coming your way Spring 2015.